The seeds of ITT Tech’s collapse were decades in the making. 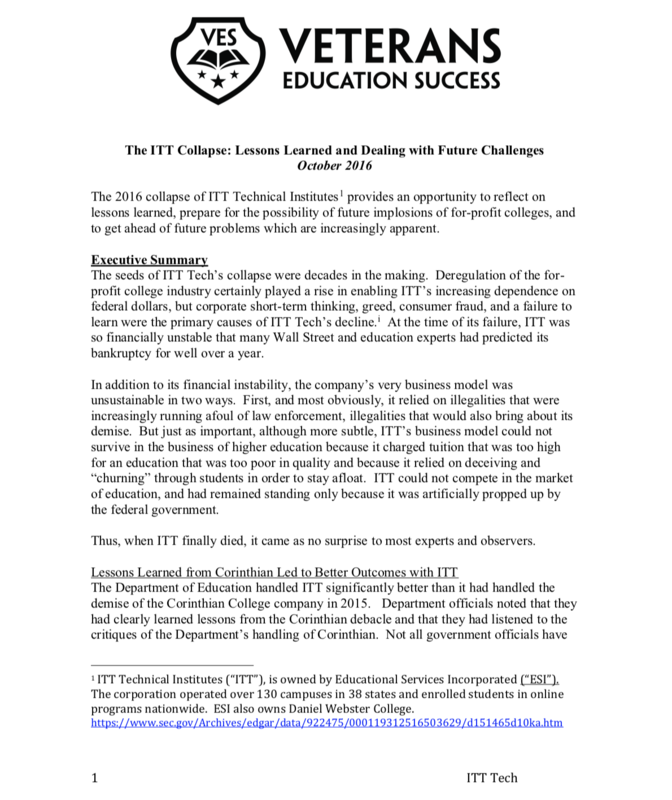 Deregulation of the for-profit college industry certainly played a rise in enabling ITT’s increasing dependence on federal dollars, but corporate short-term thinking, greed, consumer fraud, and a failure to learn were the primary causes of ITT Tech’s decline. At the time of its failure, ITT was so financially unstable that many Wall Street and education experts had predicted its bankruptcy for well over a year. Many other for-profit colleges are financially unstable, and/or have an unsustainable business model, posing a risk to the taxpayer funds that are propping them up in the overwhelming face of likely failure. What does it mean to have an unsustainable business model? It means that a company cannot expect to continue to thrive in the higher education market if it is not artificially propped up by the Department, because its tuition is inflated, its education is poor quality, and it engages in consumer fraud in order to lure students to enroll.